The popular Saturday Night Special® Torque Converter delivers premium performance at a reasonable cost. A great choice for show cars and street rods, this converter incorporates many of the manufacturing processes and performance features found in TCI® full competition models, including furnace brazed fins and a hardened, pre-ground pump hub. Fully streetable with no modifications required. noticeably poor and failure rates are high. True stall rates are not accurate. These converters often lined up poorly with the transmission spline. Strange noises were often a problem also, and this was indicative of failure soon to come. ost units were even close to being similar to the high cost units, we would sell them. As a matter of fact, in years past, we did sell them. It wasn't long before we realized they were not the product they claimed to be. The warranty on them from the manufacturer was also a problem. Over the years, we have dropped numerous non-branded products due to quality far below what is acceptable. I can't see any justification for ever running one of these low cost units in a car. You would be better off buying a high quality used converter and take your chances with it rather than one of those low-grade units. It is my strong recommendation that you invest in a high quality torque converter. You should have 1/8" (.125") to 3/16" (.1875") between the torque converter and flexplate before pulling the converter forward and bolting it to flexplate. Performance enthusiasts often underestimate the critical role torque converters play in putting their expensive horsepower to the pavement. TCI® street/street rodder and street/strip converters are designed by experienced drive train engineers to provide a significant increase in performance on the street or at the strip. With a more efficient stall speed, faster acceleration and better mid-range power, your machine will get the rear wheel power it deserves. Some special features of TCI® torque converters include furnace-brazed fins for reinforcement and durability as well as heat-treated sprag races for increased strength and lifespan. 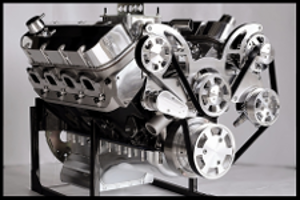 They also utilize bearings that increase thrust capacity and reduce drag, as well as turbine spline reinforcement welds for increased durability and a heat-treated steel hub that increases converter strength. TCI® employs a highly specialized production process that involves ensuring that each unit is built to spec. 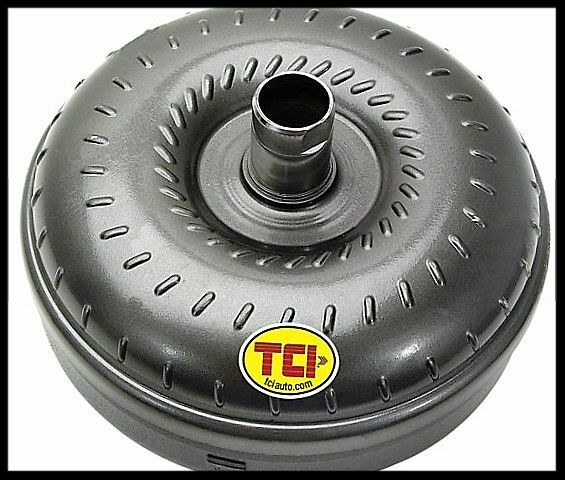 Regardless of category or price level in which a TCI® torque converter falls, rest assured that it has been Triple Tested during assembly. Once all prep work on the component parts has been completed, the impeller is welded to the front cover. Immediately following this process, a pair of dial indicators is employed on a rotating table to verify that the impeller body and pump drive hub remain true. Each unit is then pressurized and subjected to a leak test to confirm the integrity of all weld seams. Last, each unit is computer balanced to reduce annoying and potentially damaging drive train vibrations that can occur from an unbalanced torque converter. That’s Triple Tested, so that you can be confident you’re receiving a torque converter that’s perfect for your specific application. 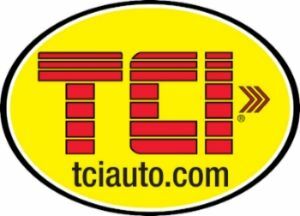 TCI® Automotive, LLC warrants that all of its products are free from defects in material and workmanship, for a period of 30 days on Racing equipment and a period of 90 days on Street/Strip equipment. The warranty period begins from the date of purchase. We recommend that you keep your invoice or receipt because proof of purchase date is required. This limited warranty shall only cover the original purchaser.